Welcome to Novembers Helpful Hints. Well, it seems that these monthly helpful hints are proving quite popular. However, judging by the responses and comments I've received, it appears that I ought to rename it "Dave's Diary!" So, by popular demand, Dave is back. 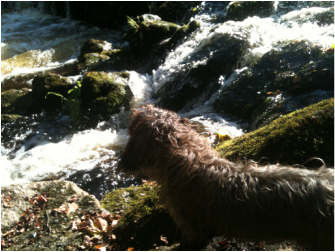 This month you can see him sitting by the waterfall on the river below Castle Drogo, watching the salmon leap upstream. It truly is an amazing spectacle, seeing fish leaping and swimming up waterfalls in order to spawn upstream, where they themselves were born. As a result, our usually quiet river walk sees an influx of visitors hoping to witness this phenomenon. The National Trust, who manage the area, put up signs this year to make visitors aware of a potential hazard. There are countless exposed tree roots along the path which are easy to trip over if you're not concentrating on where you're walking but are instead looking out for salmon. "When you're walking, walk. When you're looking, look." Great advice for the walk, but it's also a reminder that whatever we're doing, we ought to be 'fully present' whilst we're doing it! How much time in the last month have you been 'fully present', living in the moment, and how much time have you been doing one thing but lost in your mind thinking about something else? It may seem to you sometimes that you have no choice about what thoughts you have and when you have them, but you do have a choice! And, remember, it's when you're doing one thing and thinking of another that you're most likely to trip yourself up! If you want to know more about living in the moment, free from thought, worry, stress or anxiety, let me know! Dave the dog, watching the salmon leap! If you could ask the jumping salmon what the time is, they would all give you the same answer, "It's now!" So, whatever you're doing now, be 'fully present' whilst you're doing it! I have put together a simple but very helpful document called 'The Wheel of Life' which is designed to replace the "LifePlan" document which I know many of you found a bit cumbersome! It allows you to measure your contentment on a scale of 0 - 10 with 8 areas of your life and then come up with small, achievable steps, that you could take to improve each area. The idea is that, one by one, you work through the steps, using positive visualisation or inner rehearsal, preferably whilst meditating! You can download or print this document below. If you feel that you need help to become a 10, please get in touch! "Suffering needs time. (i.e. Living in your mind in the past or the future) It cannot survive in the Now!" So, where are you going to spend the next month?